Blogger is a free Google tool for creating blogs and it is available to use with your BishopApps account. It will host your blog for free on blogspot.com. You can also use Blogger to automatically ftp your blog posts to your own web space. Blogger has a basic WYSIWYG editor. 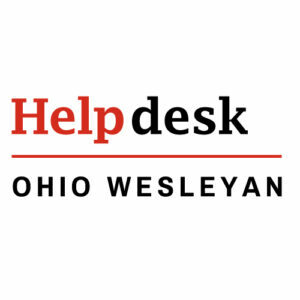 An alternative is to contact the IS Helpdesk and create a blog on our own WordPress Server. In order to use Blogger, you will need to set up an account. Setting up a Blogger account takes three easy steps. Create an account, name your blog, and choose a template. You can host multiple blogs with the same account name, so you only need to do that part once. 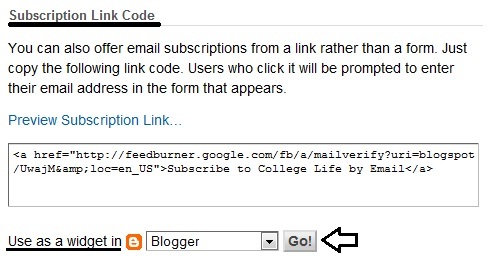 Although Blogger itself does not have an option for readers to sigh up to receive email alerts for new blog posts, this can be made available using a tool like FeedBurner. 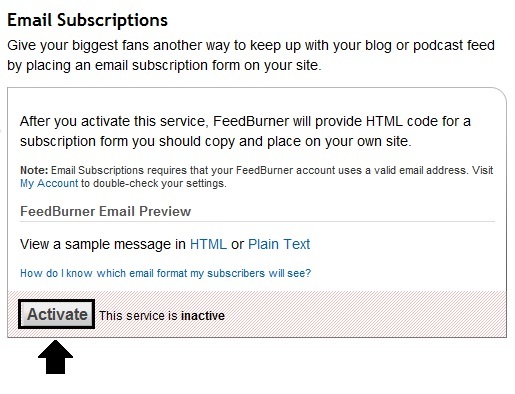 FeedBurner is a widget that can be used on your blog to allow others to sign up for email alerts to your blog. 1. 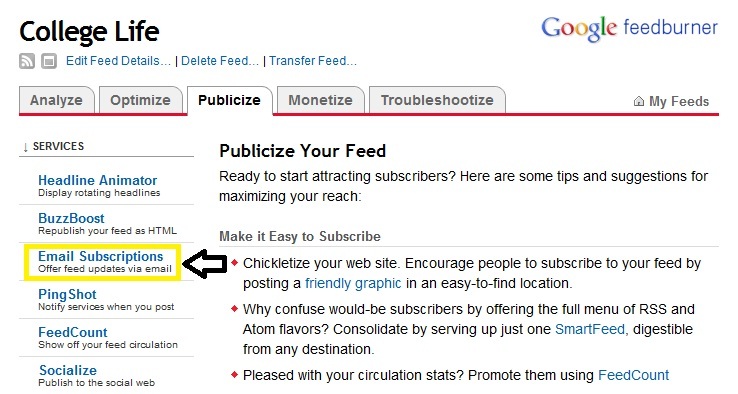 First, burn your blog feed in Feedburner. 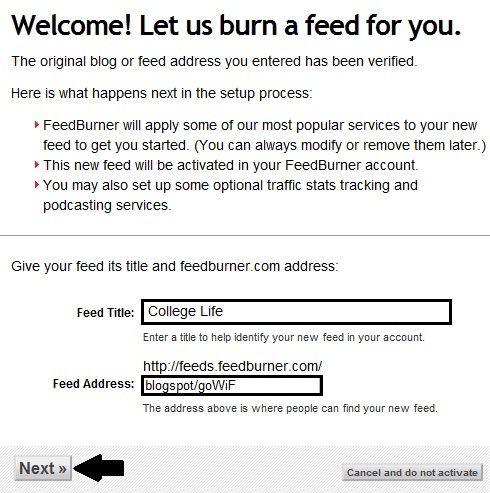 To do this, sign in with your OWU email address and password at Feedburner and enter your blog URL address in the “Burn a feed right this instant” box. Click the Next >> button. 2. You’ll be asked what source to use, Atom or RSS. There is not much of a difference between the two; either will work just fine. Atom is relatively newer, whereas RSS is more popular among bloggers. Choose one and click the Next >> button. 3. On the “Welcome! Let us burn a feed for you.” screen, make any changes desired to the feed title and address, or leave the default as it is.Click the Next >> button. 4. On the “Congrats!” screen, just click the Next >> button. 5. On the “Get More Gusto” screen, just click Next >> button. 6. When it shows your blog in the Feedburner screen with “You have successfully updated the feed” along the top, then you’re ready to create the subscribe link or form. Click on the Publicize tab. 7. Along the left click Email Subscriptions in the list of services. 8. Click the Activate button at the bottom of the screen. 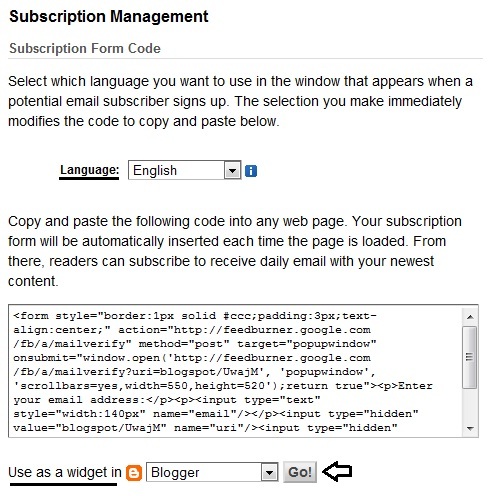 The Subscription Management section of the screen will expand allowing you to select a language and create either a form widget or a link widget. A form widget will include a subscription form right on your blog page; a link widget will open the form in a new tab or window. Whichever you choose, go to the appropriate “Use as a widget in” field and change that to Blogger. Click the Go! button. 10. You will be taken to a Blogger screen to add a page element. You can modify the blog or title if you want. Click the Add Widget button. 11. This will bring you to the “Add and Arrange Page Elements” screen, where you can arrange your widget on your blog page as you wish it to appear. If you change it’s location, click the Save button.